On the day of the finals, transparent clouds travel through a sky of china blue. The air is crisp and cool, as if the seasons have changed and left a single autumnal day in honor of the past champions. At the entrance to the Tribune présidentielle, the box reserved for honored guests and dignitaries, Juliet Mills sits at a table examining a complex seating chart, wondering where to put Belmondo, and Princess Caroline and Philippe Junot. 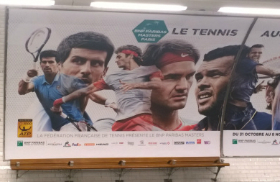 Mills, a former film star, is now in charge of the celebrated at Roland Garros. Each day she attends to their needs and works out a seating arrangement as assiduously as a debutante giving her first dinner party. On the floor of the stadium, a Signal Corps bad in khaki uniform plays brassy music as the galleries slowly fill. Runners of crimson velvet crisscross the court beneath the feet of ball boys who stand at parade rest holding a panoply of flags. A single strip of carpet provides a path from the court to the end of the stadium, up the stairs of the presidential box, and into a portal lined with royal guards in uniforms of black and red with burnished helmets. The stadium is full now; the band is silent. Some 18,000 spectators await the start of the ceremony. Suddenly the guardsmen raise their trumpets and sound a brisk fanfare. 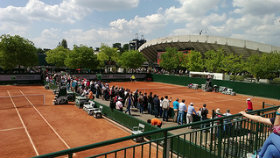 All eyes are fixed on the portal as the announcer intones the name of Henri Cochet, the seventy-six-year-old Frenchman who was the first champion of Roland Garros, and triggers an avalanche of applause. 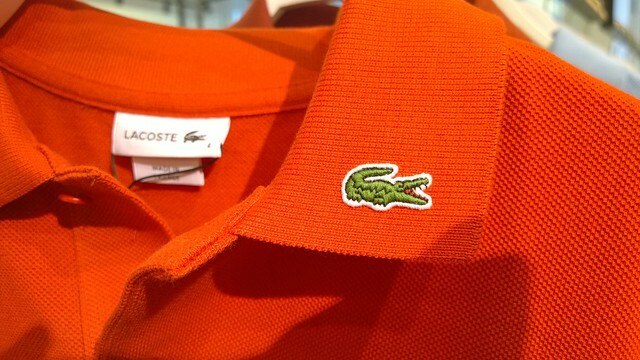 Next comes René Lacoste, le crocodile, who turned his inelegant nickname into a trademark known throughout the world. Then Jean Borotra, the bouncing Basque, who smiles and waves casually, hardly pausing as he takes the stairs with the sprightly step that earned him his nickname. As he joins his fellow musketeers before the French standard, the parade of champions continues chronologically, from Peggy Vivian to a beaming Don Budge. There is Hoad, the blond bull wearing a mile-wide smile, looking as robust and invincible as ever; Darlene Hard Wagoner in a blue polyester pantsuit with a loud geometrically patterned top; Manuel Santana, the virtuoso, dapper and compact in a blazer of navy velvet. 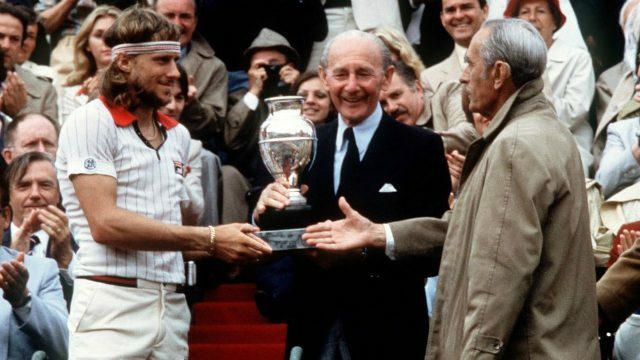 The speaker reaches 1973 and the name Bjorn Borg. There is a moment of anticipation and then Borg appears, his hair clean and long and golden in the sun, his body lean and angular in the track suit that fits him like a second skin. And then 1977 is called. 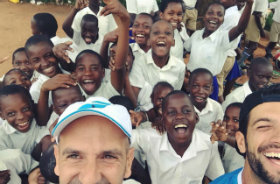 Vilas steps out to a warm welcome. Vilas takes the stairs with his head bowed and proceeds to where Borg and Panatta stand chatting. He realizes his error and looks for the Argentinian flag. When he arrives before it, he exchanges a few words with his neighbour, Santana. Borg held a long first game to start the match, then broke Vilas when the defending champion made three puzzling errors and double-faulted the love-40 point. Vilas broke back, but Borg won the next four games running to take the first set, 6-1, in a mere thirty-seven minutes. Vilas is strong and Vilas is steady. Borg is his equal in that, but Borg is also frightening quick, and his consistency is neither defensive nor aimed at prolonging a point; it is merely an aggressive tactic to prepare him for the killing stroke. Errors from Vilas’ backhand begin to come with disturbing frequency. Each time he misses, he throws the racquet from his left hand to his right just as he concludes his follow-through, then snaps his left palm upward in a gesture of despair. It is meant only for the eyes of Tiriac, who sits courtside, just behind Vilas’ chair, sending a multitude of subtle hand signals to his protégé. Absorbed in the match, Tiriac resembles some prehistoric turtle, with his broad, curved back and the sad, impassive eyes set deep in his head. The eternal cigarette cupped in his right hand is raised every other moment to the mustache that frames his mouth like an inverted horseshoe. When Vilas looks over, Tiriac will nod or just blink, but the blink seems loaded with profound implications. Tiriac is no help today, for Borg is really on form, and Vilas has not mastered the attacking game well enough to force his opponent out of his rythm. After Borg wins the second set, also by 6-1, Tiriac advises Vilas to attack in the third. In desperation, Vilas begins to hit his flat first serve. He takes the initiative. He attacks, but he is tentative and flounders like a man caught in a bad dream. The dividends are higher now, and after surrendering an early break that gives Borg breathing room, Vilas manages to hold on and take three games. But he cannot stop Borg when the Swede serves for the match at 5-3. 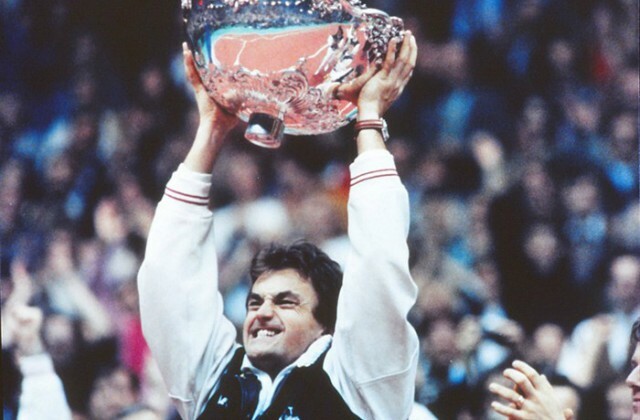 When Vilas hits a volley out to give Borg the match, the winner drops his racquet and slowly, almost as if he is yawning, raises his arms high above his head. He turns toward the players’ box, and for the first time in the match, he looks at his coach, Bergelin, and his fiancée, Marianna. When Vilas sat down to the reporters, the light in his eyes expessed relief. “He gave me no chances to win. He made no mistakes. I think he played much better than me today,” he admitted. “Why not?” a woman reporter asked kindly. When Borg appeared, his hair hanging in thick, wet strands about his ears and shoulders, he was smiling. “There will be a big kiss tonight,” Borg quipped. Someone suggested that Vilas might have a complex about him, but Borg would not confirm the theory. However, he allowed that his easy wins over Vilas in their last few matches had put him at a distinct advantage. A late arrival asked Borg if he was doing anything special that evening. 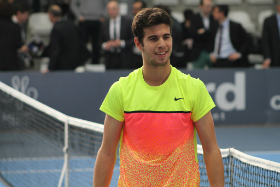 “Yes in one hour I go on plane for Belgrade to play Davis Cup,” said the champion. On the way out, I asked Borg what he would like to do on the private jet waiting at nearby Charles de Gaulle airport to take him to Belgrade. 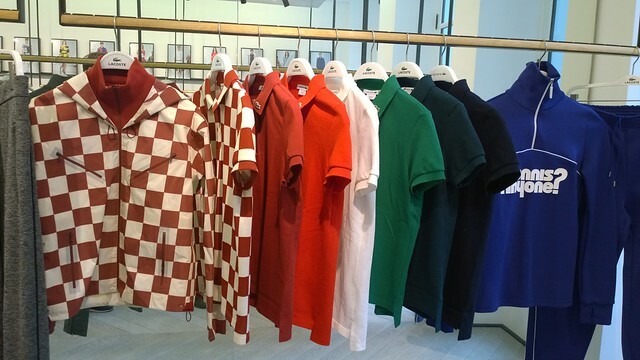 I’ve been lucky to get invited to a quick tour of Lacoste‘s showroom in Paris last Monday. The opportunity to have a look at pieces of the Fall 2015 fashion collection, the tennis collection, but also the soon-to-be released LT12 hybrid racquet. 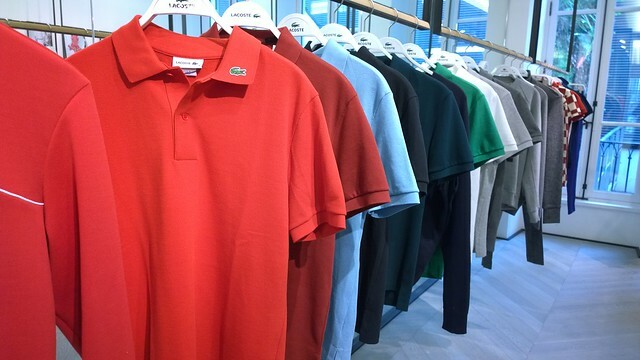 French tennis great René Lacoste invented the polo shirt and the tennis-ball machine but also the metal racquet. 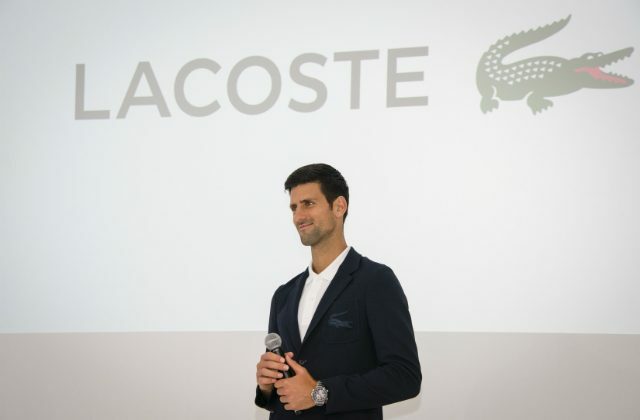 In 2015, animated by the same quest for innovation, Lacoste launches the LT12, a hybrid racket born from the combination of wood (70%) and graphite (30%). 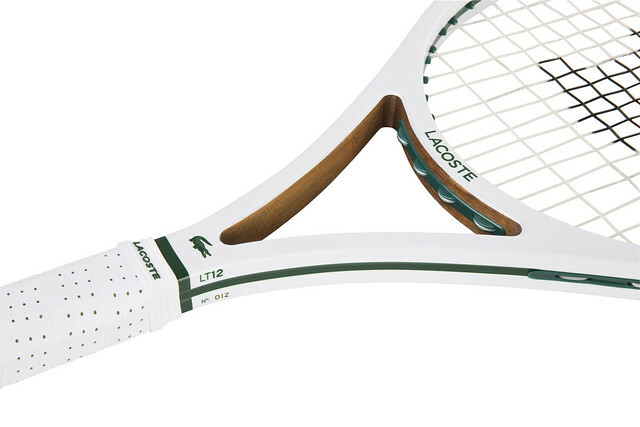 Entirely made by a French craftsman based in Albertville, each racquet takes five hours to produce. The LT12 racquet, produced as a limited edition of 650 numbered pieces, will be available from April 2015 at the price of 550€. Davis Cup didn’t mean much to me when I was growing up. I don’t remember watching it on television (and it isn’t like Davis Cup was all over the tube back in the pre-cable days). So I had no preexisting reverence for the event. This made it tough to commit to Davis Cup because, like most top players, I put the ability to perform at my peak in Grand Slams at the top of my priorities. And Davis Cup asked for a lot, timewise. In 1991, France put together a magical run under captain Yannick Noah, a very popular former player and French Open champion. 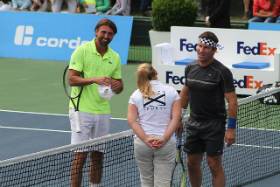 Guy Forget and Henri Leconte, two flashy lefties, carried the French squad to its first final in the Open era. 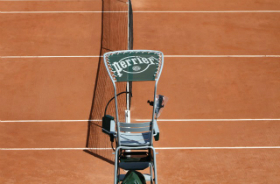 And the French also had the home-court advantage over their final-rounds rivals – the United States. They chose to play the tie on fast carpet in an indoor stadium in Lyon. When France announced the surface, US captain Tom Gorman had a stroke of genius – at least theoretically. Although I had lost my US Open title in the “ton of bricks” match, I was the best fast-court player in the nation. I was the ideal guy to have on the squad alongside Andre Agassi. But Gorman seemed to completely forget that I was a rookie on the tour, and he discounted the unique pressure for which Davis Cup is renowned. For some reason, playing for your country on a team can really get to you. Some players are inspired and react heroically; others get cold feet and feel intimidated by nationalistic pressure. Throwing a green player into the cauldron in an away final before a wildly partisan crowd was an enormous gamble. When I arrived in Lyon, I found the anxiety and stress surprisingly high. I guess that’s partly because all the USTA officials were around, like they always are at Davis Cup, looking over the team’s shoulder. 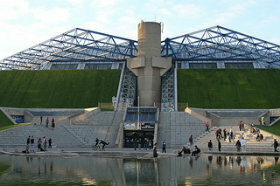 It also had something to do with the fact that this Davis Cup final was a huge, huge deal in France – it seemed like the entire French national press corps had descended on the venue (the Gerland Sports Palace) for the final, hoping to record how France won its first Davis Cup since the days of yore when the famed “Four Musketeers” – Jean Borotra, Jacques Brugnon, Henri Cochet, and René Lacoste – reigned over international tennis. We had a team Thanksgiving dinner at the hotel in Lyon the day before the start of the tie. 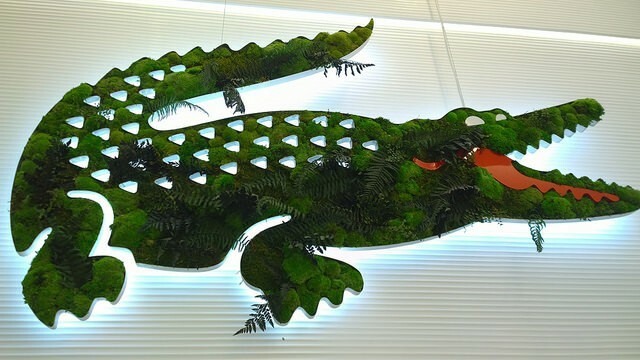 It was prepared by a famous chef, but even that event was slightly strained, because we were together with a bunch of tennis officials, and we all had to wear a coat and tie. I’ve got nothing against appropriate dress, but it seemed that everything was ceremonial, forced, difficult … when what we really needed as a team was to relax. All these things bore down on me extra hard, because I had been nominated as the number one singles player for the United States. It was like an NFL rookie quaterback getting his first start in the Super Bowl. Gorman was also uptight; that became evident to me. We were always having these team meetings, and to me that didn’t make sense. They just magnified everything and added to the stress. All my life, I preferred to operate with a low profile – I’d rather be understated than dramatic, cool and aloof rather than confrontational and all gung ho. I just don’t believe in making things bigger than they need to be, even some things that may seem awfully big, like winning the Davis Cup. At the end of the day, it’s easier to take the attitude that they’re just tennis matches; you go out, do your best, let the chips fall where they may. I was happy to talk with Gore, our veteran captain and a former Davis Cup star himself. I was glad to hear what Andre Agassi thought. But these meetings – everyone was just sitting around talking about the next day’s pratice or the upcoming pairings. Ken Flach, one of the doubles players (partnered with Robbie Seguso), looked at me in one of those meetings and asked, “You going to serve and volley on both serves, Pete?” I just looked at him, thinking, I’m one of the top players in the world, and you’re a doubles specialist who can’t even make it in singles. Where do you get off, asking how I’m going to play? It sounds arrogant, but I was just feeling prickly and uptight. At the same time, though, I never went into a match with a cut-and-dried game plan. I knew my own strengths and the kind of game I felt most comfortable playing, and tried to be aware of what my opponents did well or badly, and how to get to their games. But I always liked to “feel” my way into a match, fine-tune what I would do based on my level of play and the feedback I was getting from across the net. The quality of my serve on any given day often dictated how aggressively I played. My feeling for how I moved on a given surface (or on a given day), combined with the quality of my opponent’s return game, determined how often I followed my serve to the net. I operated by instinct, figuring things out as I went along. Flach’s question put me on the spot, seeking a commitment I wasn’t prepared to make. It was innocent enough, I guess; my reaction spoke volumes about how defensive and tense I was feeling. 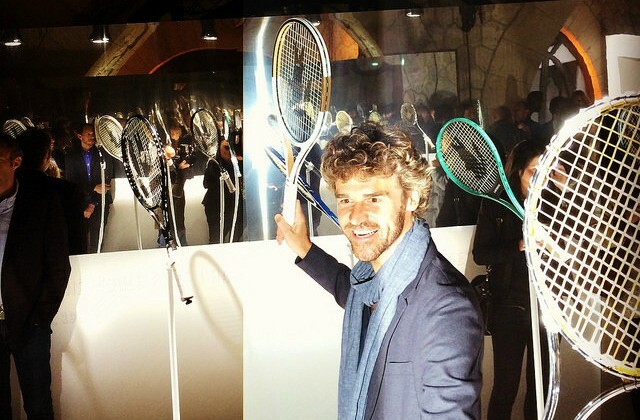 On top of everything else, the French singles players were veterans capable of playing lights-out tennis. There were no question marks about the team; if anyone could handle pressure of playing at home, it was these guys. The adulation of the home crowd would inspire them. If the fast carpet suited my game, it suited theirs just as well. I was our number one singles player, but the draw determined that France’s number one (Forget) would open the proceedings againt our number two, Andre. I watched from the bench, cheering Andre on as he took care of business to put us up 1-0. I was impressed and slightly intimidated by the crowd. The place held just over seven thousand, but it was sold out, so the overall effect was of a huge, deafening crowd. My moment of reckoning was rapidly approaching; I was up next, the US number one against France’s number two, Leconte. What happened was, I froze. It was that bad. It was deer-in-the-headlights-grade paralysis. Notice that I didn’t say “I choked”. As I wrote before, there is a big difference. Freezing is worse. It prevents you from getting to that critical point where you can choke (or not). The score just seemed to fly by, like so many of Leconte’s winners. 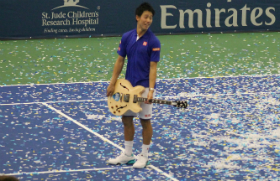 When I was serving, I’d stand up at the line and wait, while the crowd was going nuts. I just stood there, absorbing all the karmic energy, waiting for them to quiet down. That was a big mistake – I should have asserted greater control over the situation by walking away from the service notch to wait until they calmed down. That would have represented control, and playing at my pace. It was something I learned in Lyon that would come in handy in many later matches. I lost to Leconte in straight sets and left the court shell-shocked. On Saturday, the French won the doubles to take a 2-1 lead. On the decisive final day, I faced Forget in the first singles match to keep the US hopes alive. I hadn’t had enough time to process what happened on Friday, or to identify the lessons from my awful first-day experience. I gave Forget only token resistance as he clinched the Cup for France in four sets. It was a tense and miserable week. Gus, who was my roommate on the trip, tells me that the night we lost, we went to sleep pretty early. I woke some hours later, clearly in the throes of some nightmare, and screamed – at the top of my lungs – Go USA! Then I went back to sleep. I think it was a reaction to the crowd noise during the tie. I had never been exposed to anything like that, and maybe I just needed to fight back or assert myself, even if it was just in a dream and too late to matter. The explanation for this disaster seems simple. I was the wrong man for the job. And to this day, whenever anyone brings up that tie in Lyon, I just shrug, grin, and tell them “Wrong man for the job”. I don’t want to blame Gorman, or anyone else, but the one thing that was painfully clear by the end of the final against France was that Pete Sampras, a raw youth, was completely unprepared for the demands of Davis Cup play. He was the wrong man for the job. There was, however, a personal silver lining, Tim Gullikson, waiting in the wings to take over as my coach, saw how much I struggled against the French lefties. He felt that I stood too far to my right when I was receiving serve, exposing too much of my backhand. He wanted me to stand farther to the left to send the signal that I was looking to touch off a big forehand return. It was a cagey move, because lefties just love attacking a righty’s backhand, especially in the ad court. The results were remarkable; I think I won my next thirty-two matches against left-handers after he passed on that tip. I shudder to think how different my rivalry with Goran Ivanisevic, another lefty, might have turned out had I not changed my receiving stance.